Destruction and danger wreaked by fire and the hopeless aftermath is responsible for 70% of business, which face such horror, never recovering. Precautions to minimise this risk can be as basic or sophisticated as your fire risk assessment may necessitate. 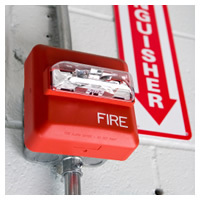 Our fire detection and warning systems offer a full portfolio of fire safety solutions that include manual operated fire alarm systems to gas detection, automatic extinguishing and evacuation. Our fire safety systems can be dovetailed seamlessly to your building automation and security systems to create total building solutions. All of our solutions are designed around the British Standard BS 5839 and our stringent industry watchdog BAFE to provide fundamental protection against fire, heat and smoke. These intelligent fire protection solutions detect dangers the second they get out of hand. Insurers, specifiers and the fire brigade themselves are demanding that the safe keeping of life and property should not be entrusted to companies without BAFE recognition. As a BAFE installer we are accredited and authorised to provide all four modules of the sp203 standard - to design, install, commission and maintain automatic fire alarm systems.